Zinc plays a very important role in the structure of all proteins and cell membranes. Nearly 100 different enzymes depend on zinc for their ability to catalyze vital chemical reactions. The symptoms of severe zinc deficiency include the slowing or cessation of growth and development, delayed sexual maturation, characteristic skin rashes, chronic and severe diarrhea, immune system deficiencies, impaired wound healing, diminished appetite, impaired taste sensation, night blindness, swelling and clouding of the, and behavioral disturbances. Oral zinc therapy results in the complete remission of symptoms, though it must be maintained indefinitely in individuals with the genetic disorder. Although dietary zinc deficiency is unlikely to cause severe zinc deficiency in individuals without a genetic disorder, zinc malabsorption or conditions of increased zinc loss, such as severe burns or prolonged diarrhea, may also result in severe zinc deficiency. It has recently become apparent that milder zinc deficiency contributes to a number of health problems, especially common in children who live in developing countries. The lack of a sensitive indicator of mild zinc deficiency hinders the scientific study of its health implications. However, controlled trials of moderate zinc supplementation have demonstrated that mild zinc deficiency contributes to impaired physical and neuropsychological development and increased susceptibility to life-threatening infections in young children. Strict vegetarians: The requirement for dietary zinc may be as much as 50% greater for strict vegetarians whose major food staples are grains and legumes, because high levels of phytic acid in these foods reduce zinc absorption. Estimations indicate that 82% of pregnant women worldwide are likely to have inadequate zinc intakes. Poor maternal zinc nutritional status has been associated with a number of adverse outcomes of pregnancy, including low birth weight, premature delivery, labor and delivery complications, and congential anomalies. However, the results of maternal zinc supplementation trials in the U.S. and developing countries have been mixed. Although some studies have found maternal zinc supplementation increases birth weight and decreases the likelihood of premature delivery, two placebo-controlled studies in Peruvian and Bangladeshi women found that zinc supplementation did not affect the incidence of low birth weight or premature delivery. Supplementation studies designed to examine the effect of zinc supplementation on labor and delivery complications have also generated mixed results, though few have been conducted in zinc-deficient populations. A recent systematic review of 17 randomized controlled trials found that zinc supplementation during pregnancy was associated with a 14% reduction in premature deliveries; the lower incidence of preterm births was observed mainly in low-income women. This analysis, however, did not find zinc supplementation to benefit other indicators of maternal or infant health. Isolated outbreaks of acute zinc toxicity have occurred as a result of the consumption of food or beverages contaminated with zinc released from galvanized containers. Signs of acute zinc toxicity are abdominal pain, diarrhea, nausea, and vomiting. 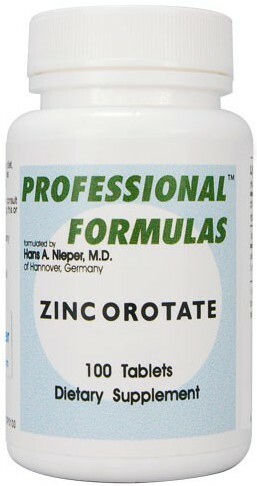 Single doses of 225 to 450 mg of zinc usually induce vomiting. Milder gastrointestinal distress has been reported at doses of 50 to 150 mg/day of supplemental zinc. Metal fume fever has been reported after the inhalation of zinc oxide fumes. Specifically, profuse sweating, weakness, and rapid breathing may develop within eight hours of zinc oxide inhalation and persist 12-24 hours after exposure is terminated. The major consequence of long-term consumption of excessive zinc is copper deficiency. Total zinc intakes of 60 mg/day (50 mg supplemental and 10 mg dietary zinc) have been found to result in signs of copper deficiency. In order to prevent copper deficiency, the U.S. Food and Nutrition Board set the tolerable upper level of intake (UL) for adults at 40 mg/day, including dietary and supplemental zinc. *Each tablet contains 9 mg of elemental zinc. Other Ingredients: Provsolv, pure food glaze, plasdone, Ac-Di-Sol, mag. carbonate, mag. stearate, compritol and avicel. *Dr. Hans Nieper was very particular when ti came to selecting ingredients and insisted we use his complex and multi-step manufacturing processes. He said no other company in the world would bother to go to the expense necessary to do it correctly. He was quite aware that several formulators and fillerswere using ingredients that he had mentioned in his lectures, but he never gave his formulas to any of these "get rich quick copy cats," as he called them. He knew they would take short cuts and not follow his specified formulations properly -- even if they were able to find out how. Only Dr. Nieper could guarantee results and he spent his whole life perfecting his formulation and products. As an addition to the daily diet, take one tablet twice daily or as directed by your health care professional. Singh RB, Niaz MA, Rastogi SS, Bajaj S, Gaoli Z, Shoumin Z. Current zinc intake and risk of diabetes and coronary artery disease and factors associated with insulin resistance in rural and urban populations of North India. J Am Coll Nutr. 1998;17(6):564-70. Falkiewicz B, Dabrowska E, Lukasiak J, Cajzer D, Jablonska-Kaszewska I. Zinc deficiency and normal contents of magnesium and calcium in metabolic X syndrome patients as assessed by the analysis of hair element concentrations. Biofactors. 2000;11(1-2):139-41.